You may be aware of the fact that there are various uses for essential oil. I wrote a post about using Eucalyptus Oil on a bug bite back in May of 2013. I just used the oil straight from the bottle onto my arm where the bug had bit me. Well recently I had a bug bite and this time I decided to use a different oil. I decided to try Peppermint Oil to help relieve the itching. With Peppermint Oil the advice is to use a carry oil with it. A carry oil is just an oil you mix with the essential oil to help dilute the essential oil. Most often wherever you buy your essential oils from they will have a bottle of carry oil to purchase too. I just use olive oil from my kitchen. I think I have used coconut oil too. I always have both in my kitchen so I just use what I have. I got a little bowl . . . a pinch bowl and put a little olive oil in it. I tried to only do a drop or two of peppermint oil, but I think a few poured into the bowl. I mixed it together and applied it to the offending site. It worked very well. Since it is minty it caused my skin to tingle a little but the itch was gone. And since it is an oil it stayed on and soaked into the skin so the relief lasted some time. Peppermint oil for PMS or menopause symptoms can be used in different ways. For cramps you can diffuse the oil or you can add it to a warm bath. It also might be helpful to dilute it with a carrier oil and then just rub it on your belly or on any muscle that is cramping. With a hot flash situation having a spritzing bottle with peppermint water in it might help. Just mist your face and/or body during a hot flash. So if you have some peppermint oil around it can help relieve itching from bug bites, aid in digestion, give relief to cramps and hot flashes. Do you use essential oils around your home? 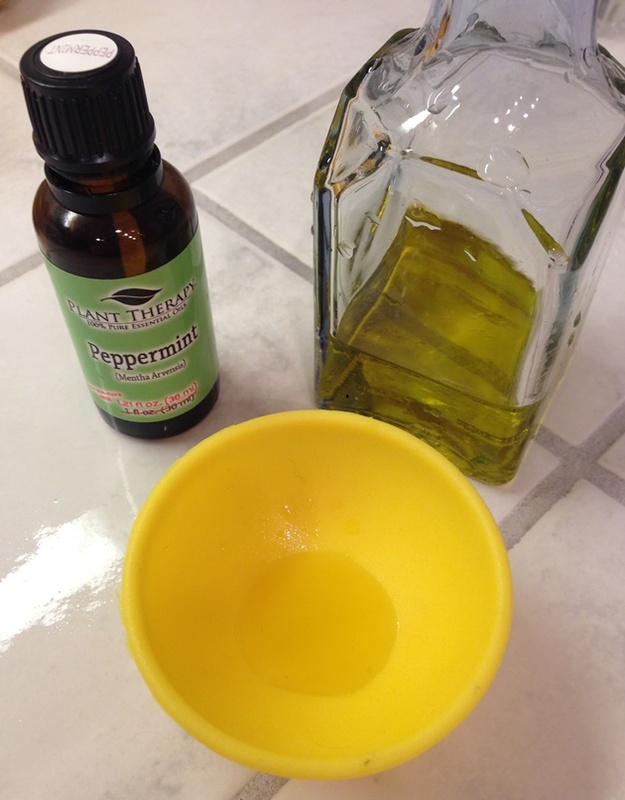 What do you do with peppermint oil? Ahhhh, essential oils. The claim is that they can cure many ills. Well, perhaps not cure, but help with many things. I haven’t looked it up lately, but I am not sure that there are very many studies regarding the benefits of essential oils. But to me it just makes sense that the oils from plants would be beneficial. Many medicines and therapies have been derived from plants, so it makes sense that their oils can have health benefits. The way the oils are used can give you different benefits. Some need to be taken orally, some need to be applied topically, and some can be diffused. I actually like to think they can all be diffused and in doing so you will gain some benefit. There are different ways they can be diffused. Some work well when a few drops are placed into a candle and then the candle is burned. Some work great in diffusers, the kind that get plugged in with water and the steam or mist diffuses the oil. 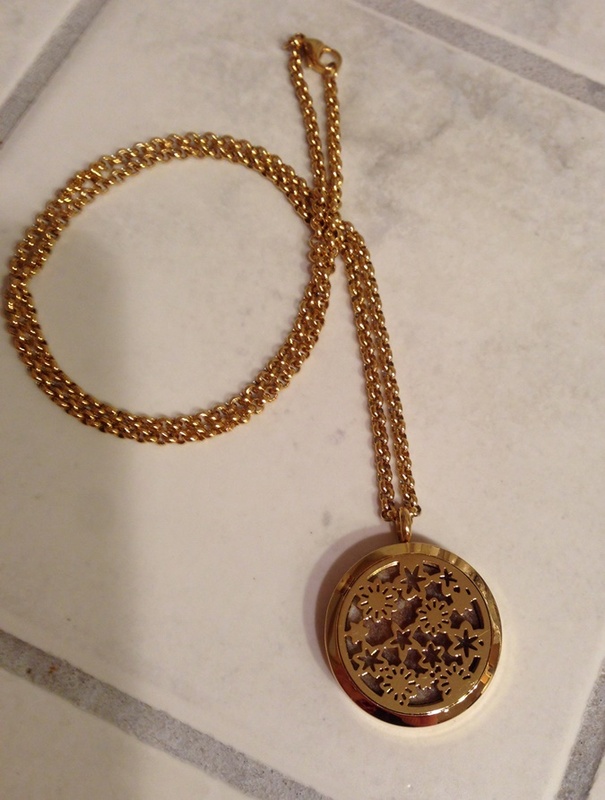 I found a cool necklace that I like to use. I searched on Amazon for a diffuser necklace because I wanted to have the essential oil with me, right under my nose or not too far anyway. A place where I could smell the aroma of the oil. I found this really cool one. There are many reasons why it is cool. For one, it is pretty. I think it is described as “Golden Fireworks”. I think of it as flowers, but I think they call it Fireworks. It came with three different pads. I made the mistake of using a black oil (I didn’t know it was black, I had never seen a black oil before) on the white pad. So it turned the pad black. And it fades to a very unattractive color. But that doesn’t really matter (except when I am taking pictures of it for a blog post) because it is in the diffuser. Another reason is, it is really heavy . . . as in it feels like very good quality. It is not flimsy. It is a very nice piece of jewelry. 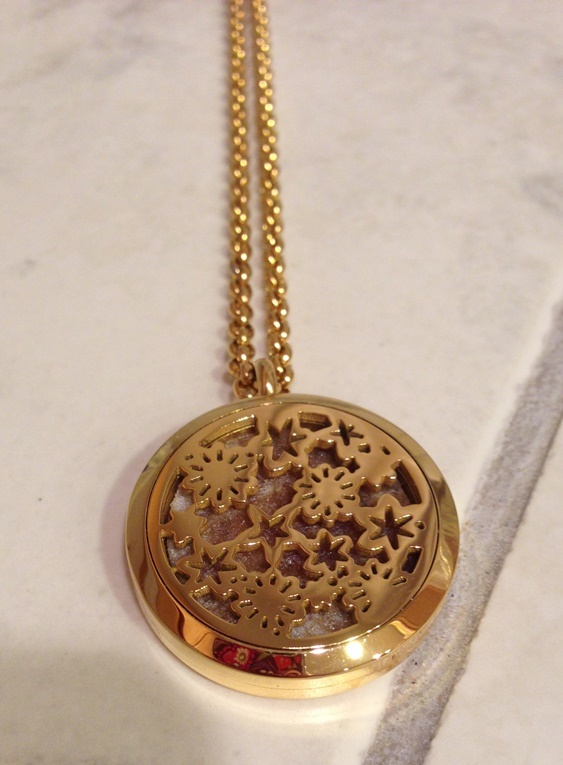 I was somewhat worried about what the quality would be like because it was a $15.00 necklace. 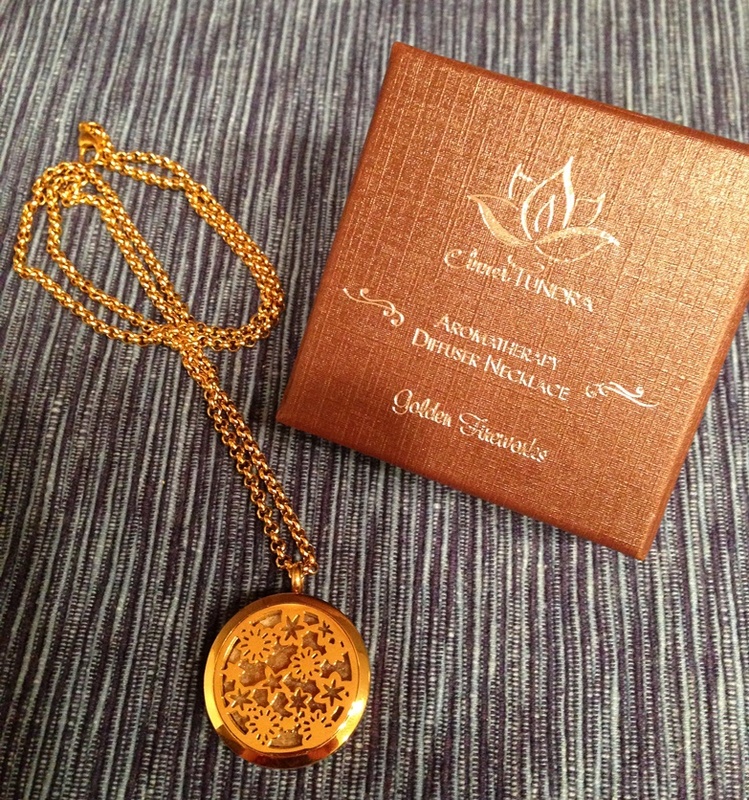 I read the reviews and many commented on the quality and weight of the necklace, but you still never can be sure until you receive the item. But it a very nice quality. Anyway, I really like this. I love having the aroma of whichever oil I chose to put in it, float up throughout the day. I have different discs (pads) for each oil I use. The said thing is, when I wear it my little cat won’t come near me. She is so sensitive to smells. She hates most fragrances . . . perfumes, lotions, sprays, etc. And when I bend over to hug and kiss her the necklace invariably swings right at her and she is assaulted with the aroma. Then I take it off, but she is annoyed and won’t come near me. 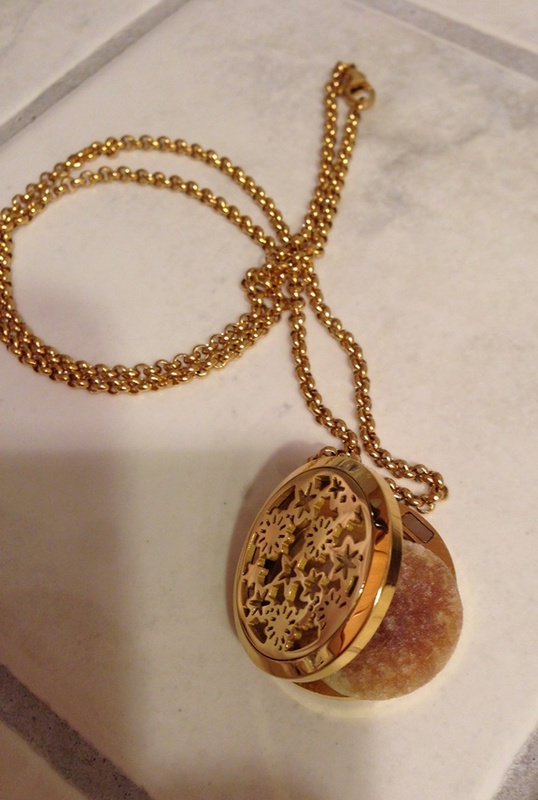 But other than my cat not liking it (again, she doesn’t like any strong smell), it is a great necklace. I just saw the other day on Facebook (I think, must have been because that is where I see everything) a bracelet that is a diffuser. It looked kinda cool because it was lava beads. You just put the oil on the lava beads and it gets diffused that way. I think that is niffy. But I wonder how you changed the oil? Perhaps the it needs to be washed to get the oil out. Oh, I just thought of that. So I think having separate discs/pads is much nicer because you can just switch therapies really quick. Do you have a favorite way to diffuse essential oils? Every thought of jewelry to do it? It has been a couple months now, but I kept forgetting to post about it – but now I remembered. I am not an expert at essential oils. I don’t think to use them all the time for everything. I know there are people who use them for everything. I think that is great. I do think to use them sometimes, but not all the time for everything. And it has been months since I used lavender oil and coconut oil to soothe a burn. In August when I went to Santa Cruz, it was overcast on my side of the hill, so I didn’t think I would be getting that much sun. I did put on sunscreen, but I didn’t reapply it while I was there because it turned out, it was overcast there too. I was out too long for what I had applied. So when I got home my chest and forearms were red. I wanted some relief from the heat. I thought about essential oils. I thought I had seen that they can be used for sunburns. If you look it up, they can. There are a lot of different recipes for sunburn relief. Some have more than one oil, but I just opted for lavender oil and coconut oil. 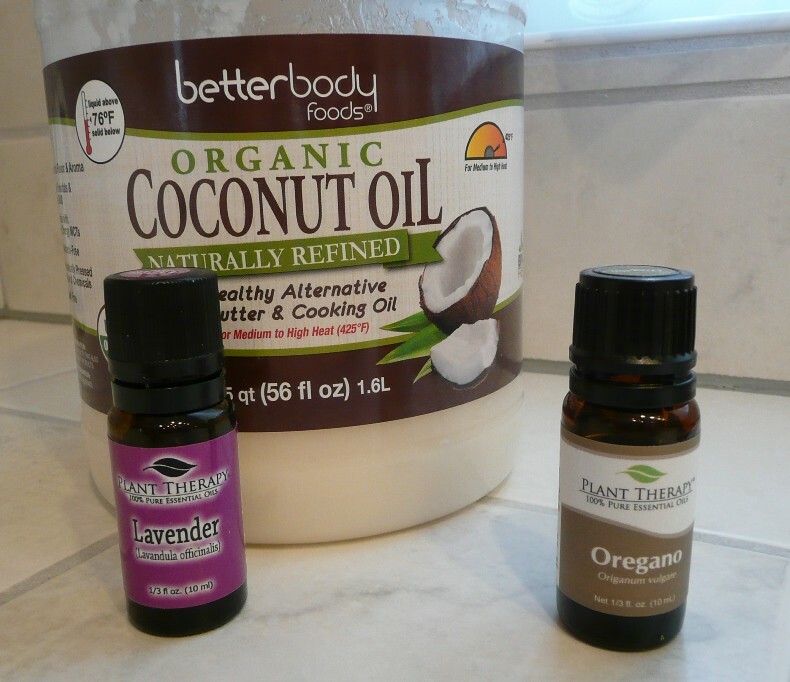 I put a little, like a tablespoon of coconut oil in a little pinch bowl and then about five drops of lavender oil. I mixed it and put it on my chest and forearms. It was fragrant relief. It seemed to cool the burn down right away. I like it. I applied it one more time that same day. Then just two more times. Not only did it take the heat away, it moisturized it and kept it from getting flaky and peeling. So, simple lavender oil and coconut oil. I am going to assume you can use whatever carrier oil that you usually use and it would work. A couple of days ago I was hanging up some of our hummingbird feeders and I used oregano oil to keep the ants off it. That was really cool. I poured it on the hanger, then walked outside holding the hanger. Well, some of the oil got on my fingers. So then I wiped the oil on the S hook that holds the feeder. And I watched as the ants approached it then turned around. So then I wiped the oil on the tower where the S hook was hanging and the ants did the same thing there. They started towards the oil, but turned away from it as soon as they were close enough to touch it. Interesting. I wish it had some staying power. It tends to dry up rather fast. But it works for a little while. I am not sure that once it is dried, if the residue keeps the ants away. But it was fascinating to me to see them turn away. What is your essential oil recipe for sunburns? 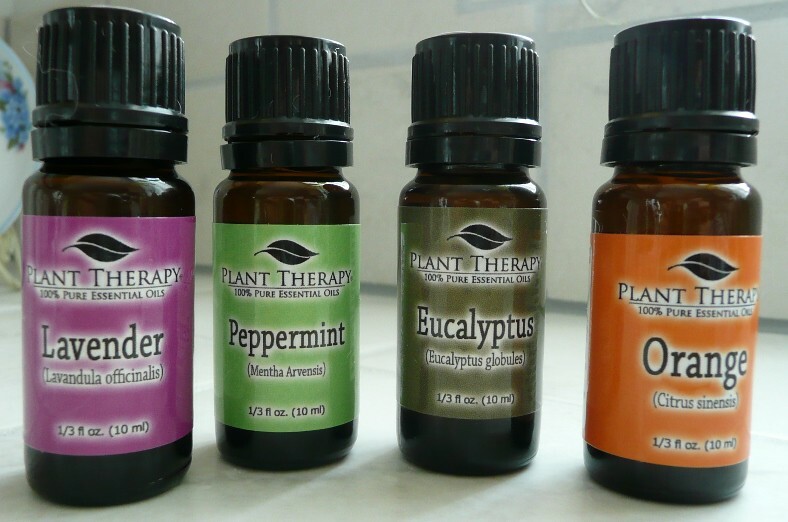 Do you use essential oil to deter insects? Oregano Essential Oil – What To Do With It? So recently I bought some oregano essential oil and I have yet to use it. I don’t even remember why I bought it, I mean I would have bought it with a specific purpose in mind, but then by the time I got it I forgot. Or . . . what could have happened is I purchased it with a specific purpose in mind thinking I needed oregano essential oil for that, but when I went to re-check on what I needed for that purpose I didn’t need oregano oil. So now I have oil and I am not sure what to use it for. I am thinking it is one of the essential oils used to boost the immune system. I probably bought it for that because we were entering cold season and I thought it might give us some extra fighting power. Or maybe I thought to buy it when we were in the throes of our fungus situation. Perhaps I wanted to use it to help with that. Or perhaps I wanted to use it to help with sinuses, as in allergies. I honestly can’t remember. I don’t cook with oregano because I think it is one of those flavors I am not particularly fond of. This essential oil smells smokey. I actually like the way it smells. But I am still not sure what I bought it for. 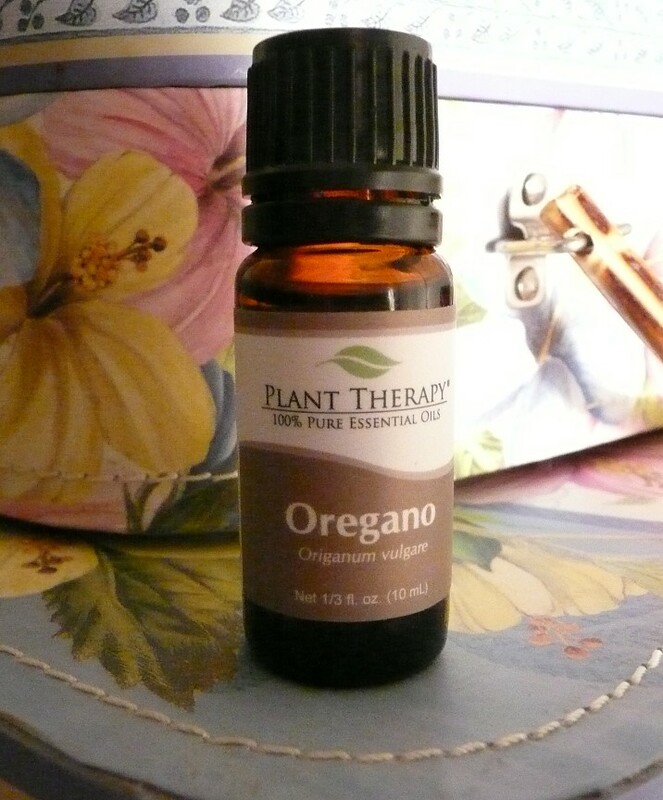 Do you use oregano oil? What do you use your essential oregano oil for? How do you use it? The Special Nia Events that I held at the end of March were held at a dance studio in Campbell called Range of Motion. Well, the owner of the dance studio opened a store next door called Range of Wellness. It sells supplements in the form of vitamins, minerals, and protein powders. It has a few lotions and shampoos. It even has a few things for pets (treats, supplements, shampoos). When I was there completing business with the owner I noticed there was some essential oils on her desk. She just got them in. 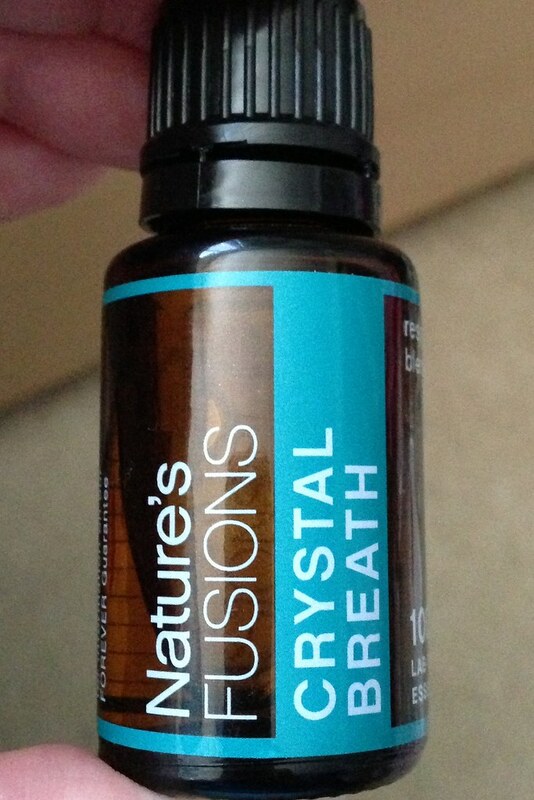 I picked up Crystal Breath and loved the way it smelled. I didn’t even know what it claimed to do but I loved the way it smelled so I wanted it. I use my oils as aroma therapy. The “therapy” part can be loosely defined. I usually just go by the smell I feel like smelling at the moment. That is why I purchased the Crystal Breath without knowing its intent. It smells so good. “This blend opens pathways and increases clarity. Some people suffer from asthma, or exercise-induced asthma. During an asthma attack, the airways tighten and close, restricting air supply to the lungs. Drinking plenty of fluids, slowly warming up to physical activity, practicing active relaxation techniques, and breathing moist, warm air can help reduce dangerous attacks. 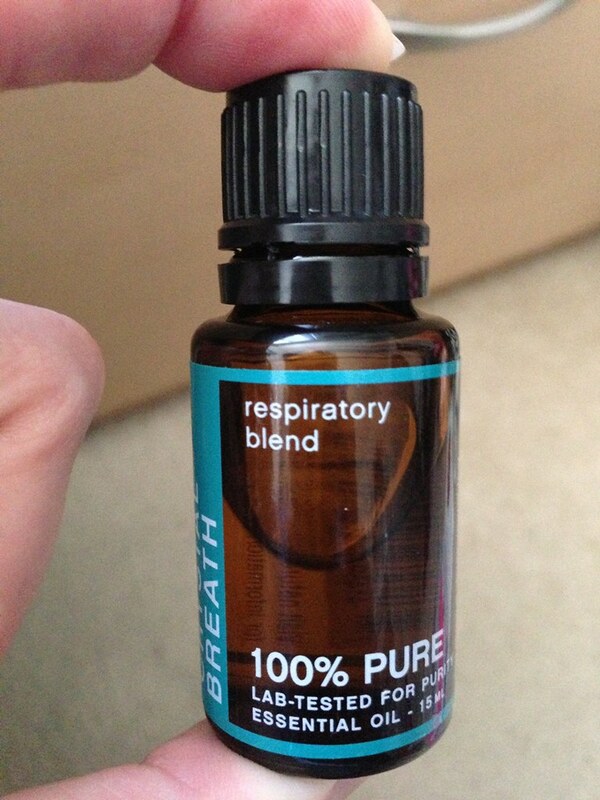 I’d like to point out, the website does NOT say this essential oil blend is good for people with asthma. The website just has facts: “Some people suffer from asthma, or exercise-induced asthma. During an asthma attack, the airways tighten and close, restricting air supply to the lungs.” And then states what probably most asthma sites, doctors, and asthma suffers would recommend. This is an important thing to notice . . . this site is not making a claim regarding asthma, although it is claiming that applying it to hands will open thoughts and increase clarity. I just like the way it smells. I have put it on my wrists to allow me to smell it as I breathe. I cannot attest to it opening my thoughts or increasing clarity, but I can say it makes me smile because l like the fragrance. Since it is one of the few oils I have actually applied to my skin, I have bothered to add it to a candle to burn. I just dab some on my wrists. The other oils I don’t “wear”, I put drops in my candles. So I don’t know what the effect is in a burning candle. So, there you have it, a new to me oil blend. What about you? Are you using essential oils? What blends do you like? Remember in my last post I said I get grumpy when I am not feeling well? Well, sometimes it is not actually grumpy but it is a feeling of feeling off. And sometimes it is not because I am sick, but I am not feeling 100%. I kinda mentioned this in that same post. Well, I think I am hearing fluid in my ear. I remembering hearing that garlic is good at helping heal ear infections. But I don’t have any garlic cloves. I have some garlic already minced and I don’t think that is what they have in mind. I am also thinking it is not really an infection because it doesn’t hurt and I know that ear infections DO hurt. But I do hear something. So in trying to figure out what to post today I was looking at my blog and I saw the category “Essential Oils”. I thought, “Hey, I know they can be used to treat ear infections.” So, I looked it up. The first site I happen to click on said something about sometimes it is not even really an ear infection it is just a build up of fluid. Ah-ha! It gave some suggestions on helping it too! So since I am not having the pain associated with an ear infection, but I am sometimes hearing something . . . I think, I will go with that diagnosis. It is extra fluid and not yet an infection. I know not everything I read on the internet is true, but I do when it makes sense and matches up to what I was thinking. I am doing to try one of Homemade Mommy’s ideas. There are a number of single oils and blends that can serve well to support the body when confronted with an earache. These include. . . They recommend diluting and using a cotton swab or a cotton ball. Every site I have looked at states to dilute the oil and rub it in and around the ear. Of course, I didn’t think about this until the last-minute before I have to go out. If I were just “going out” I probably could get away with putting it on my neck, but we are going to a Sharks Game so I will be somewhat bundling up so the oil would just get all over my scarf or jacket. I will wait until I get home to apply the oil to the appropriate places . . . but I think I will put a little in and on my ear. So what do you do when you have an ear ache? What do you do when you have an ear infection? Do you use essential oils? What kind? How do you do it? I was looking at my collection of essential oils and I found it interesting. The ones I use the most are peppermint, lavender, and eucalyptus. The ones I use the least are Ylang Ylang, Bergamot, and Frankincese. They are also the three that I only have one bottle of. I bought a set that contained peppermint, lavender, and eucalyptus. I used it and bought another set. I used those three out of the set and bought another set. At least I THOUGHT I bought a set, but I must have duplicated my order and ended up with two sets. Which is fine because of the three I use all the time. Plus I have used them in my sugar scrub so that uses them up more quickly. But I was interested in learning more about the three I don’t use often. Also I happen to see some information on Ylang Ylang. So I decided to do more research and report about it. I find it most interesting that the bottle of the brand I purchased states ” . . . Ylang-ylang Essential Oil is best suited for use in the perfumery and skincare industries.” I know that when you mix scents with other scents you can come up with something delicious, but . . . seriously??? Have you ever smelled Ylang Ylang? It is an odd scent. I can’t really describe it. The words that came to mind made it sound good , but I wouldn’t really call it a good smell. It REMINDS me of smoke flavor. I know that is odd to assign a scent a flavor, but that is what I think of. I have not tasted it. I am not that brave. In addition to smoke flavor I think of a wet barrel. Not wet wood, but a wet barrel that might be a bit moldy. So odd, that is what it smells like to me a smokey wet moldy barrel . . . yet it is used in the perfume industry. And I even used it in the sugar scrub. The bottle also states: ” Ylang-ylang Essential Oil can assist with problems such as high blood pressure, rapid breathing, nervous conditions, as well as impotence and frigidity.” I can see why it might help with rapid breathing because when you smell it you stop breathing to keep the scent out. Ok, it is not really THAT bad, but I also think I am used to it. 🙂 Which could be a result of correcting the “lack of Libido”. I had included it in the scrub to help relieve stress. Aroma Web says: “Ylang Ylang Oil is a rather interesting essential oil as its distillation varies a bit from most other oils, and this can affect the composition and aroma of the oil.” Perhaps I need to smell a different version. Of course, these are claims and I would recommend visiting a medical professional to make certain there is not a serious medical condition causing any of the above symptoms. I also would like to remind readers that every one is different and every body is different and something that might help one person might not help another. I personally know that I am healthy enough with no underlying medical condition, that I can use this oil for these symptoms if need be. I think it could help release feelings of anger, tension, and nervous irritability if I have them. 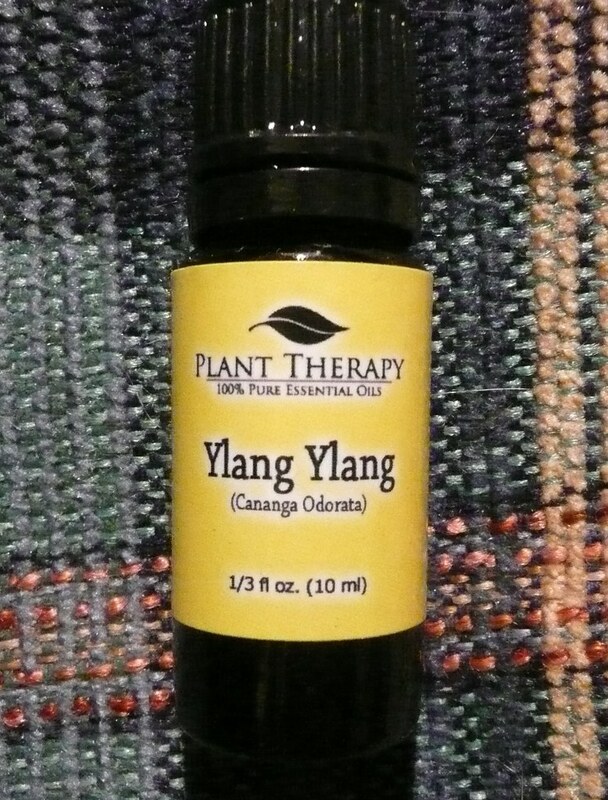 If you use essential oils, do you use Ylang Ylang? What do you use it for? How do you use it? Do you like the smell? How would you describe it (the smell)? I think I mentioned in a post somewhere that my cat is sick. For you animal lovers, please know that we have been to the vet and we are working on a treatment and so the cat is getting medical attention and we have a plan. But with this condition comes some unpleasant symptoms. As many of you have experienced a situation where someone is sick you might be aware of the unpleasant odors that accompany certain situations. I love candles and I have many with wonderful scents and fragrances. I love to burn them to add to the comfort of our home. Many companies have recently produced a lot of fruity and fun type of scents. All of those scents are lovely when you are just wanting to light a candle for the ambiance. But when you want to scrub the air and really have the odor be gone a pretty little tea light is not going to do the trick. While I imagine a diffuser would be the best way to use the essential oils, I have been put mine in candles. I actually feel that the essential oils help disinfect the air and not just mask the odor. I could just be deceiving myself, I don’t know, but I DO know that the essential oils help elevate the smell whereas the fru-fru candles do not. What I do is put a mixture of drops in a tealight. And place them around the house. Since my cat’s disease involves her digestive system I usually add a few drops of Peppermint to a non-scented tea light. Peppermint essential oil contains menthol, which is a proven aid to digestion. While the “proven aid” could mean through oral consumption . . . I hope that breathing it in assist with the digestion. Because there is no way I can feed it to my cat! It also helps with nervous stress. I often use lavender essential oil for calming nerves. Plus it is a nice scent to have around the house. I feel it helps deodorize the air. Another essential oil I use to help scrub the air is Tea Tree. I think of its strong scent as fighting off bacteria, fungus, and viruses. 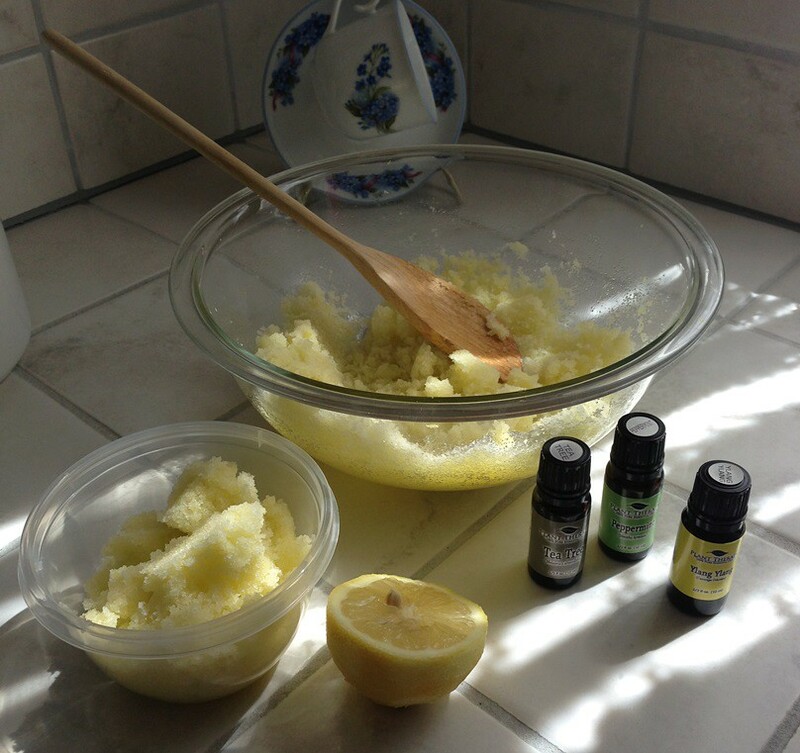 I recently used this in the sugar scrub I made for these very same properties. I use Eucalyptus because of its strong menthol type of aroma. It really helps combat odor. I also use Ylang, Ylang because it helps with nervous conditions and is used in perfumes and cosmetics (for its aroma). Sometimes I will have a candle with Lemon-grass essential oil in it because of its anti-depressant affects and its antiseptic properties. The Orange essential oil also is an anti-depressant, and has a list of other benefits including aiding in digestion. Again, many of the benefits might be from taking them orally or using them topically, but I think that having the oil released into the air helps too. And since I am not going to put them ON my cat or have her ingest them the air release is as close as we are going to get. I do not put Frankincense into a candle because the one time I did it burned oddly. It seems highly flammable. So while I think Frankincense Essential Oil is great to use, I don’t put it in the candles. I have been pouring it on a paper towel and leaving it in the room. Many sites recommend this as the one oil to get. If you are only going to get ONE oil, they say, get Frankincense. So I added it to my collection. It has a strong woody aroma. One of the benefits of it is thought to be help with the digestion so that, in addition to the strong aroma is why I add it to the scents in our home. I really would like to get a diffuser, but I am not sure what to get. I feel as if the “good ones” are really expensive. So I am beginning to look at some less expensive ones and read the reviews. Reviews are always to be taken with a grain of salt, huh? One person “loves it, it is perfect” and another thinks it is “the worst thing in the world, not worth the money”. For now, I mix my own oils, just putting a few drops into a tealight. Then after it burns the oil is still in the holder and it lets off the scent. I really feel that essential oils do a better job of removing unpleasant odors then flowery candles or spray deodorizes. I LOVE my beautifully scented candles, but to me, they are to add to a nice clean aroma not for cleaning the air. 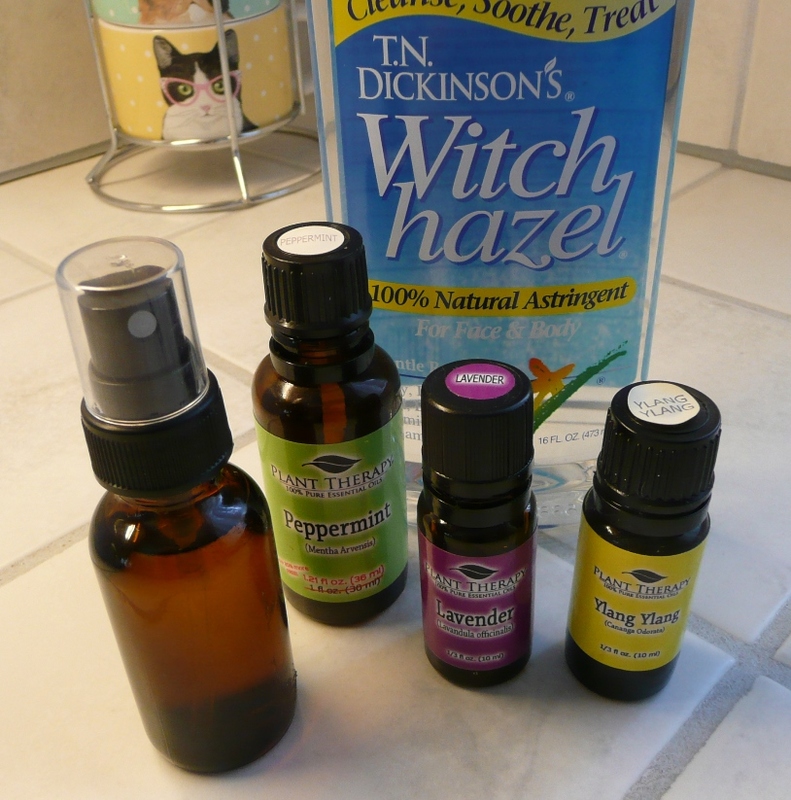 Since I posted when I bought my oils I thought I would share with you how I am using them . . . besides in sugar scrubs! What do you use to alter the aroma in your home? Do you know of a good diffuser? So last Christmas my sister-in-law gave my hubby and I wonderful book. But she gave ME some sugar scrub. It was lemon-mint. I thought that was a great idea. I had always wanted to do that with essential oils. Well, as you might be able to imagine there are a ton of sugar scrub recipes out there and on the internet. So if you are here looking at mine —- THANKS! Some of the scrubs I have had have been a little too oily for me, so I was going for a less oily one. To me the scurb-y part of the sugar is what you want. The essential oil for a little therapy. The oil can be a moisturizer but it doesn’t have to be a lot. So I futzed with a few of the recipes I found on-line. I actually made my first batch months ago and this is when I am getting around to posting about the scrubs. So I don’t remember where I got the recipes that I futzed with and I don’t remember what I did the first time. 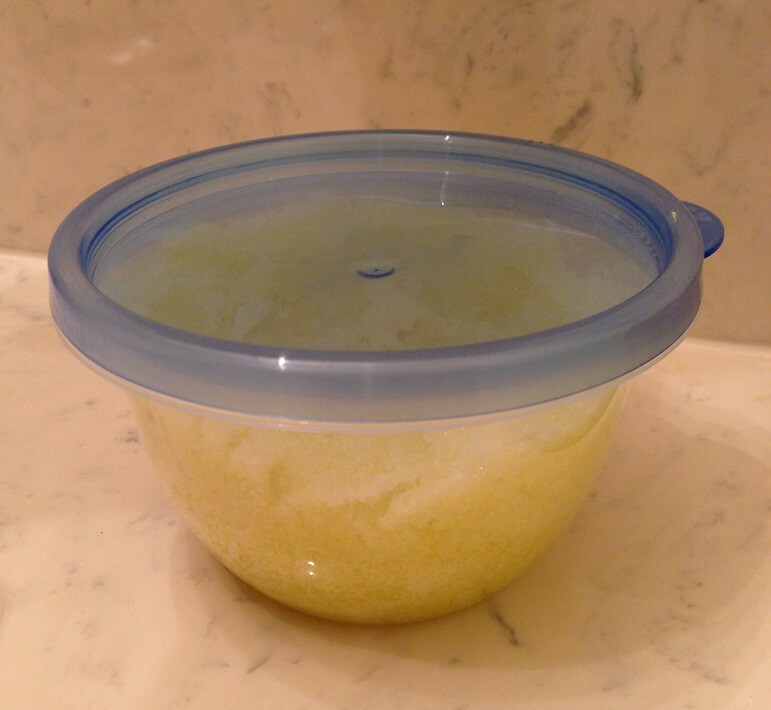 But here is my latest recipe for a nice sugar scrub. Put the sugar in a bowl then pour some of the oil in. Don’t use it all at first. Stir and stir until it is well combined. Then half of the peppermint. Mix well. Then add the remaining drops of peppermint. Mix well. Add more olive oil. Mix well. Add the Ylang Ylang. Mix. Add the tea tree, then mix. Add only as much of the olive oil as you want. You may even want more oil. But add then mix. It tends to LOOK like it is not enough but then as you stir is mixes in and the sugar gets saturated. So pour and mix. When you are done adding all the oil you want, then add the lemon juice. Then add the lemon zest. Mix, mix, mix. I have canning jars which really make a nice presentation, but they start to rust in the shower/bath. Plus you have the band AND lid to deal with. It is kind of a pain in the shower. So I was looking for a pretty flip top jar, but then I realized that the little hinge would probably rust. So finally I settled on something that is not as pretty, but I think it is much more functional. Just a regular plastic container. One lid to deal with, easy on, easy off. No screwing and unscrewing involved. No metal to rust. Again, maybe not as pretty, but I think it will be better in the end, because rust isn’t pretty either. I chose a peppermint essential oil because it has an invigorating effect, so I thought that would be good for morning showers. Ylang ylang is for stress relief, which many people would appreciate. Tea Tree Oil helps stimulate the immune system. It is known to fight bacteria, fungi, and viruses. To me that is perfect in a scrub. Since I teach Nia which is a barefoot cardio dance, I think of scrubs as being primarily for my feet. So a scrub that invigorate, relieves stress, AND fights bacteria and fungi —- is GREAT. I hope you like it. Of course you can use an essential oil you like. What oil will you use?